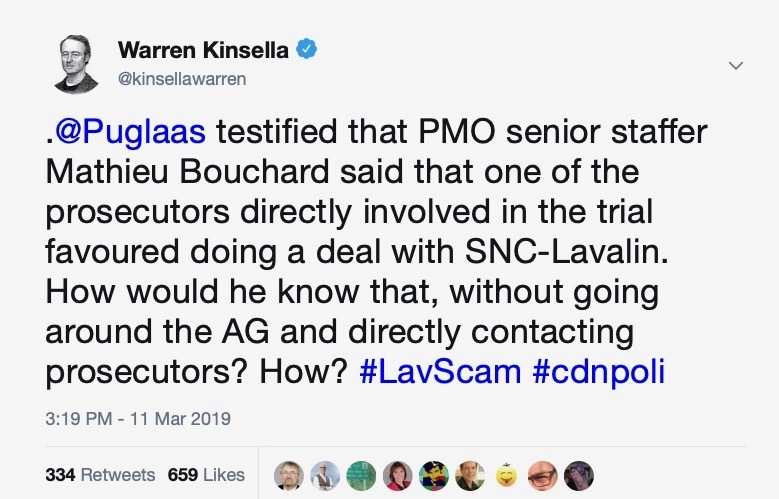 #LavScam latest: did PMO have direct contact with prosecutors in the SNC-Lavalin trial? That’s what the Globe and Mail is suggesting in another shocker this morning. I have wondered the same thing. Huge reporting by Fife and Team. And, if true, this moves things closer to obstruction of justice. Big time. The Prime Minister’s Office will neither confirm nor deny the assertion by former attorney-general Jody Wilson-Raybould that senior advisers to Justin Trudeau had inside knowledge of discussions within the independent Public Prosecution Service about the criminal prosecution of SNC-Lavalin. Ms. Wilson-Raybould has alleged that the Prime Minister’s Office [PMO] told her chief of staff about an apparent internal dispute between director of public prosecutions Kathleen Roussel and one of the federal prosecutors handling the SNC-Lavalin bribery and fraud prosecution. In testimony before the Commons justice committee last month, Ms. Wilson-Raybould described a Sept. 16, 2018, conversation between her then-chief of staff, Jessica Prince, and the Prime Minister’s Quebec adviser, Mathieu Bouchard, and senior adviser Elder Marques about negotiating an out-of-court settlement with SNC-Lavalin. Ms. Wilson-Raybould says she plans to provide follow-up written testimony this week to the committee to show there was high-level political interference in the SNC-Lavalin matter. On this point, I think there’s a reasonable explanation that doesn’t involve inappropriate PMO interference. The lobbying registry shows multiple SNC communications with PMO both before & after DPP declined to offer the DPA in Sept. 2018. Multiple contacts were with Bouchard and/or Marques. It’s entirely plausible that the SNC rep shared info with Bouchard/Marques that the corporation had gained via its own counsel on the criminal charges. Based on personal experience as a Crown agent for PPSC, regular discussion of the DPA issue would’ve been happening between SNC defence counsel & the trial prosecutor(s). However, those trial prosecutors wouldn’t necessarily have authority to grant a DPA, even if they were sympathetic to SNC’s arguments. PMO has botched this entire file, and certainly applied inappropriate pressure on JW-R, but I hold out faint hope their people weren’t so dumb and/or corrupt to make direct contact with the trial prosecutor(s). I thought of this too – the information may have come from SNC-Lavalin. But how would SNC-Lavalin know about disagreements within the Prosecutor’s office? I doubt they would get that from their direct negotiations with the office; I’d expect the Prosecutor’s team to act like, well, a team. So where did the information come from? I sure hope the RCMP is investigating. If not they become another institution tarnished by the purveyors of corruption. Yes, the RCMP! Why are you so confident in them being interested? Look at what the RCMP did with money laundering! They weren’t interested to investigate. Maybe not dumb. Just arrogant! This isn’t about SNC at all. Its about a native rights agenda that went way farther than it should have imperiling the constitution and Canadas very sovereignty. Trudeau opened the door and when JWR tried to kick it open all the way Trudeau shut it all down. Indeed, further evidence that JT is/was “not ready” for prime time as the notorious Harper Conservatives’ ad campaign alleged! All because of JT’s dumb axiom that “because it’s 2915” the cabinet HAD to be 59% women irrespective of their qualifications! Now that was/is stupid. Any indigenous peoples’ rights issues are completely irrelevant to the allegation – the very serious allegation – that Trudeau interfered in a criminal process in order to pervert the course of justice.